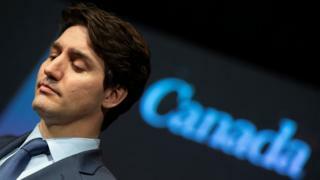 Canadian Prime Minister Justin Trudeau has denied wrongdoing after he tried to shield one of the country's biggest firms from a corruption trial. In explosive testimony, ex-Justice Minister Jody Wilson-Raybould said she faced "sustained" pressure to abandon prosecution of the Quebec-based firm. They are also demanding a public inquiry following Ms Wilson-Raybould's testimony on Wednesday before the Commons justice committee in Ottawa. Speaking to reporters on Thursday morning, Mr Trudeau said he disagreed with his former justice minister's "characterisation" of events and maintained his staff followed the rules. The prime minster said he had full confidence in an inquiry by a parliamentary justice committee into the affair and in an investigation by the federal ethics commissioner, and would "participate fully" in that process. Ms Wilson-Raybould told the justice committee on Wednesday she had faced attempts at interference and "veiled threats" from top government officials seeking a legal favour for the Montreal construction firm. The former justice minister and attorney general said she and her staff endured four months - between last September and December - of a "sustained" and "inappropriate effort" to push for a possible deferred prosecution agreement for the construction company. Preliminary hearings have begun and the company says it will "vigorously defend itself" against the allegations. SNC-Lavalin is one of the world's largest engineering and construction companies and employs some 9,000 people in Canada. The firm has deep roots in the vote-rich province of Quebec, which is expected to be a battleground in this October's general election. In 2016, the agency that oversees Canadian federal elections said former executives had devised a scheme to illegally donate C$118,000 to the federal Liberals and Conservatives between 2004-11. The bulk of the funds went to the prime minister's Liberal Party. In 2013, the World Bank barred the firm and its affiliates for up to 10 years from bidding on contracts with the agency for "misconduct" in a bridge contract in Bangladesh, the longest debarment period ever handed down in a settlement. Political commentators suggest Ms Wilson-Raybould's remarks are deeply damaging for Mr Trudeau and the Liberals. Writing in the Toronto Star, columnist Chantal Hebert says the prime minister was "already up to his neck in the SNC-Lavalin mess". "On Wednesday, former attorney general Jody Wilson-Raybould pushed his head down further. It will be harder for the Liberal government to dig itself out of the deep hole she dug before the next campaign." In the National Post, columnist Andrew Coyne said Ms Wilson-Raybould's testimony suggested "an attitude that appears to pervade this government: that the law is not an institution to be revered, but just another obstacle to get around, by whatever means necessary." Columnist Patrick Lagace, writing in Montreal newspaper La Presse, said her remarks suggest that "for the Prime Minister and people acting on his orders, the rule of law and the independence of the Attorney General were at least negotiable". In Maclean's magazine, Paul Wells suggests her remarks reveal a "sickeningly smug protection racket whose participants must have been astonished when she refused to play along".